In a previous exercise technique article, I examined the Cable Row and today I want to examine the ‘other’ major back movement: the lat pulldown. In this article, I’m going to cover a narrow undergrip, medium overgrip (both in front of and behind the neck) and parallel grip handle. I’m generally not a big fan of very wide grip pulldowns, I think that a medium overhand grip works just as well and wide grips tend to limit the range of motion. Note: the form issues I’m going to address go for chins or pullups as well. The only difference is that instead of pulling the bar down to your body, you pull your body up to the bar. As well, I’m going to use the term pulldown generally throughout this article, just keep in mind that it refers to all of the different variants as well as chins/pullups. As the name itself suggests, the lat pulldown has as its primary target the latissimus dorsi. This is the large fan shaped muscle that takes up an exceedingly large portion of the back. While the midback is involved somewhat in the pulldown movement (depending heavily on how it’s done), the vertical line of pull tends to take the midback muscles out of the movement. Since the arms are involved and there is bending at the elbow, of course the various elbow flexors, the biceps and brachialis, are also involved. Much of which is involved and to what degree depends on the grip used; I’ll cover this more below. With most pulling movements, including the Cable Row, many lifters tend to complain of not being able to ‘feel’ the back. They may get a tremendous arm pump but the lat seems to go unused. As usual, this generally has to do with improper form (which is often secondary to using far too much weight). One of the key aspects of getting the lats involved has to do with what happens at the shoulder. In a properly done pulldown The shoulders should elevate (move up) at the top of the movement and active shrug down at the end (in the Cable Row the shoulders move forwards and backwards). If the shoulders aren’t moving down during the pulldown, it’s an arm movement. One good cue that has been around for years is to think about pushing the elbows down, as opposed to pulling with the arms. This tends to put more focus on the lats rather than the biceps. A third and important issue (illustrated below) is that the torso needs to remain upright or, ideally, with a slight arch in the low back. If you think about lifting your chest to the bar as you bring the bar down (or pull yourself up in a chin), you’ll get it right. If you’re hunched over at the bottom, you’re getting a wonderful workout for your abs but not effectively training your lats. I’ll cover each of these issues below. 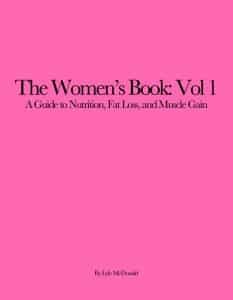 First I want to look at basic pulldown technique. The two pictures below show the basic start and finish position for an undergrip pulldown. Note that the lifter is slightly behind the bar so that the bar can come straight down to the top of the chest. In the finish position, the shoulders are down and back and the chest is up, the elbows are slightly behind the torso (indicating full lat contraction). I’ll cover this more fully in the section on variants but, of all the types of pulldowns I’m going to cover, this tends to put the biceps in the best line of pull. Most lifters will be able to use the most weight with this grip and performing this movement often decreases the need for direct biceps work. One important issue with all pulldowns is proper grip width and the picture below shows the proper grip width for the undergrip pulldown. Note that the forearms are exactly perpendicular with the bar. This is important and folks who start with grips that are either too wide or narrow (not shown but I think you can guess what this looks like) often complain of wrist or elbow problems. There are several common errors that occur with pulldowns and while I’m going to demonstrate them with the undergrip pulldown, you can usually find people doing them with all of the variants I’m going to discuss later in the article. In the left picture below, the bar is being pulled far too low. Somehow, folks find a way to turn pulldowns into a triceps pushdown at the end. In the right hand picture, the lifter is leaning too far back and turning the movement into a mid-back exercise. This usually happens when the weight is far too heavy and the lifter ends up using mostly body English and cheating to make the rep. But it isn’t a lat pulldown. As I mentioned up above, one of the far more common errors with pulldowns is lifters ending up hunched over, this usually happens when the weight is too heavy. While it make the movement a great ab exercise, it’s not ideal for training the lats. Below I’ve shown a lifter hunched over (left picture) compared to the proper ending position with chest high and lower back slightly arched (right picture). Correcting the above is usually a function of both reducing the weight and cueing the lifter to think about lifting their chest to the bar as they pull the bar down. If the lifter can’t do this, they have to keep the weight lower until they can. Again, on chin/pulldown variants, the same cue holds and the lifter should think about lifting their chest to the bar as they pull themselves up. Like the Cable Row, there are numerous variations on the lat pulldown primarily involving changes in grip position (underhand vs. overhand) and width. Since the lats do have different functions at the shoulder and lines of pull, varying the type of pulldown done can certainly be beneficial from both a strength and hypertrophy standpoint. Proper grip width for the medium grip overhand pulldown is shown in the left picture below, while bars vary, generally speaking the hands will go at the ‘bends’ in the bar. of more importance is that the forearms, again, should be perpendicular to the bar with the elbows flared as this ensures that adduction is being trained. The right picture below shows the finishing position. 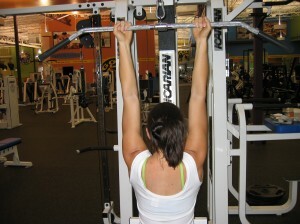 As with the undergrip pulldown, the bar is pulled to the top of the chest, the lifter’s torso is upright (or slightly arched back) with the chest high; the shoulders are down and the elbows are down and back. The same basic form errors, pulling the bar too low leaning too far back or ending up in a hunched over position can happen with this variant of the pulldown as well (the triceps extension variant where the lifter takes the bar all the way to the legs is more common because of the grip) and I’m not going to show those. I’d note that the overgrip pulldown is often done with a very wide grip, hands out to the ends of the bar. The original idea was that ‘a wide grip equalled wide lats’ but this is basically nonsense. The very wide grip tends to limit the range of motion of the pulldown severely and it’s not a variant I ever see much need to use. I’d rather someone use the slightly narrower grip shown above and get a full range of motion. Next up I want to show a variant of the pulldown using a parallel grip on a V-handle. This variant works the shoudler extension function of the lats (like the undergrip pulldown) but I have found that some find it a bit easier on the wrists and elbows. The parallel grip tends to hit the brachialis a bit more and biceps don’t have a fantastic line of pull but most will find that their poundages on this are a little bit less (but close) to the undergrip pulldown but higher than a medium overgrip. The proper starting and finishing position for the parallel grip pulldwn are shown below. Finally I want to look at the behind the neck pulldown. In recent years, similar to the behind the neck press, there has been a bit of controversy surrounding the movement with many arguing that it is harmful to the shoulder (and does nothing that other, safer variants, can’t do). And certainly there is some truth to this. However, I tend to think that the bigger issue with the behind the neck pulldown is as much to do with the flexibility of the average trainee as anything else. Lifters with poor shoulder flexibility (i.e. most of them) tend to have problems because they can’t do the movement in anything approximating proper form. This will make sense in a second. Generally, a behind the neck pulldown would start with a grip more or less identical to the medium grip overhand pulldown. A major change is that the lifter should now move so that they are slightly in front of the bar in the starting position; this is so that they can pull the bar straight down and not have to lean forwards or do goofy stuff with their head. I’ve shown the proper finish position for a behind the neck pulldown in the left picture below. As you can see, the elbows are directly in line with the torso and the head and chest are both up. In the right picture, I’ve shown what usually happens when lifters try to do this movement. A complete lack of shoulder flexibility, usually going hand in hand with poor posture (shoulders pulled forwards) leads to the right picture and this is bad. That causes the elbows to rotate back and the chest and head to drop forwards. Of course, the right hand picture can happen even when lifters have good shoulder flexibility but are using too much weight. Of course, there are more variants than this that I can’t cover. One handed pulldowns are not unheard of and there are actaully some decent pulldown machines. The Hammer Strength Behind the Neck Pulldown is actually excellent in that the handles go outside the head while keeping the elbows right in line with the torso. It is one of my favorite machines for training the lats. Another movement that can often be useful is the lat shrugdown. This is simply a pulldown without the arm bend, the focus is on letting the shoulders elevate slightly and then shrugging down hard by using only the lat. I have often used this to teach lat involvement in the movement, or as a way to finish a set (after the biceps have fatigue). It can be used as an exercise in its own right. Just keep in mind that for basically all pulldown (again, or chin/pullup) variants, the same basic cues and technique tips hold. The shoulders must elevate slightly and depress at the end of the movement, the chest should be kept high with the torso either vertical or slightly arched in the low back. If you’re having to use funky form, you’re using too much weight and, odds are, you’re not training the lats in the first place.